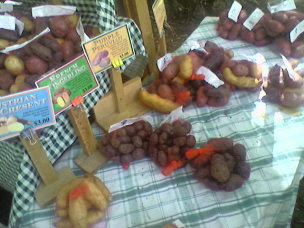 I really don't know why I have never been to the Portland Farmers Market before last Saturday. I'm almost embarrassed to say it. I who loves Portland. I who loves food. I who loves to see new and exciting things in Portland especially when it has to do with food. I have never been to the Portland Farmers Market (before last week). I think I might have been afraid of the parking situation. But that's silly. We found parking not even a block away, on the street. I think I might have been afraid that I would buy too much and wouldn't be able to carry it to my car. That's silly too. 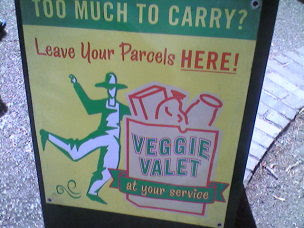 They have a Veggie Valet. There are really no excuses. Especially since it's 5 minutes from my house. The colors, the smells, the people. It all blends together like an expertly painted watercolor. If I hadn't been so famously good at sticking to my new diet, I would have eaten the homemade gourmet ice cream sandwiches, with honey lavender ice cream on a something-herby-cookie. Or had a tamale from Salvador Molly's. Or a giant biscuit from one of the stations selling breakfast. But the smells were almost as good as eating. Almost. 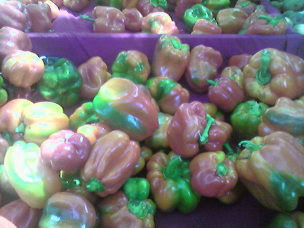 I bought luscious yellow cherry tomatoes and tie-dyed red and green peppers. I could have bought so much more. But I was famously good at sticking to my new budget last Saturday. This coming Saturday, I will not be famously good. Unless I alter my budget to accomodate my now weekly trip to the market. My friend Jen is going to make Tres Leches cake to top it off. Do you think my soon to be wedded friend will like it? I can only hope so. Oh! And I forgot drinks. We are going to do something clever and Mexican. Just not sure what yet. Any suggestions? Sans alcohol? Did I tell you that they also have live music at the Farmers Market? Totally cool. Sangria, or anything with mango, for the drinks. Blended margaritas, with or without the booze, super tasty, super mexican. how long have you been in Portland? I love connections in the portland blogosphere!